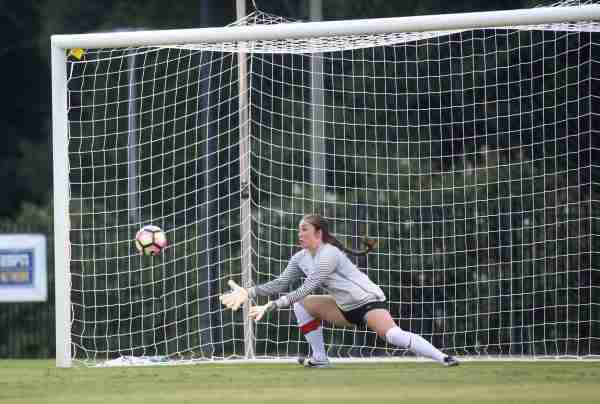 Ole Miss goalkeeper Marnie Merritt has been named SEC Defensive Player of the Week following the Rebels’ wins over Louisiana Lafayette (3-0) and Northwestern State (3-0). Merritt, a sophomore from Huntersville, N.C., helped hold ULL and Northwestern State scoreless in the Rebels’ first two games of the season. She now has nine career solo shutouts, placing her at seventh in school history and moving her closer to the top-five in Ole Miss Soccer history. In 2015, Merritt started all 23 contests in her first season of action and played a whopping 2,151 minutes in goal–third most in the NCAA of any goalie. She allowed only 26 goals for a 1.09 goals-allowed average last year–ranking her fifth all-time at Ole Miss. She enters this season already ranked 10th in school history in career saves. Ole Miss faces Memphis on August 26 in Oxford, followed by Lipscomb on August 28 in Oxford.